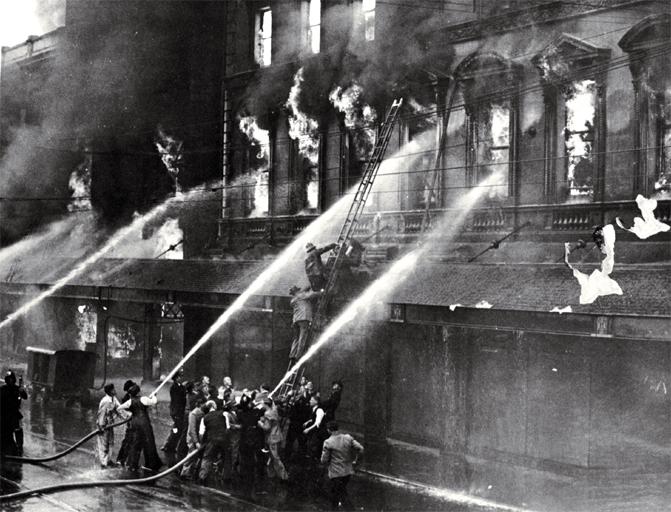 The 1947 fire at Ballantynes’ Department Store, Christchurch is the worst fire in New Zealand history, killing 41 people. 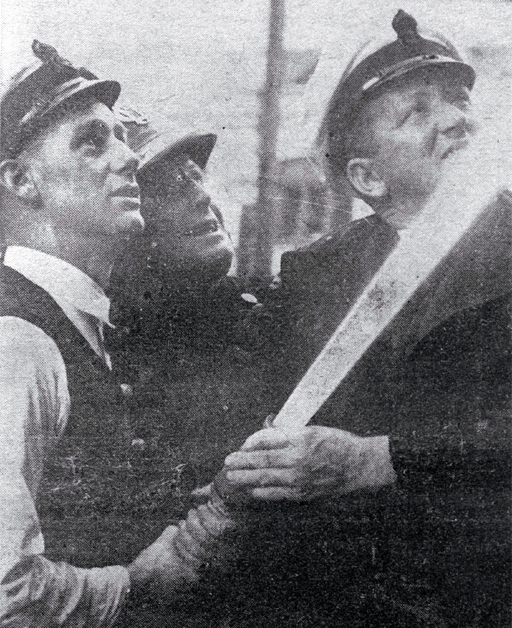 Rescuing Mr. Ballantyne from the Burning Building on Colombo Street, Christchurch. CCL PhotoCD 1, IMG0018. 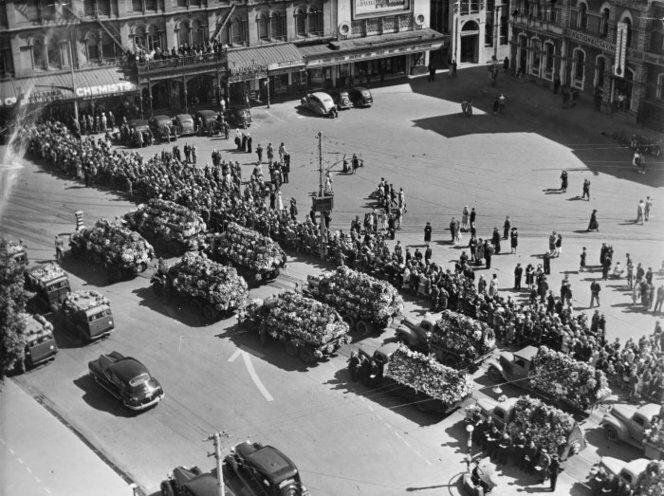 In 1947 more than 300 people were employed in the department store of J. Ballantyne & Co, situated on the corner of Colombo Street and Cashel Street in the centre of Christchurch. Most of the upper floors were staff work areas, including the dress-making department, and the credit and accounting department. At 3:31pm on 18 November, 1947, one of the salesmen employed in the store was told by a woman employee that smoke was coming up the stairs. The smoke was coming from the cellar of Congreve’s Building which was beneath the furnishing department, but there were no flames and no sound of burning. He told the woman to call the fire brigade and tell the owners. When some minutes later the fire brigade had still not arrived, the salesman began to get concerned. He worked with other members of the staff to place fire extinguishers at the bottom of the stairs. Upstairs the owners, Kenneth and Roger Ballantyne, had been told about the fire, but there was some uncertainty whether the call to the fire brigade had been made. Another call was made to be certain. This call was received at the fire station at 3:46pm. About 250 customers and the retail staff on the ground floor were moved outside, but there was no move to clear the upper floors of the staff who had just returned to work after their tea break. By now the flames had broken through to the furnishing department. At 3:47 pm fire engines arrived. At first the firemen thought it was just a cellar fire. They did not realise that people were trapped on the upper floors of the building. The fire brigade at the time was understaffed, and the two most senior officers were not on duty. The decision was made not to bring a turntable ladder to the scene of the fire as a cellar fire was not usually regarded as serious. More staff left the building just as the centre of the department store exploded in flames, blowing out two large windows. This was the first sign from outside the shop that something was happening, but within minutes the building was aflame. The fire officer in charge soon realised the severity of the fire and sent a fireman to make a brigade call that would bring out all the fire appliances in Christchurch, but the call was delayed by overloaded telephone lines. In the meantime it took a further 10 minutes for the firefighters to find the source of the fire. Some heads of departments made the decision themselves to evacuate their staff from the upper floors of the building. In the credit department the office workers waited to shut up the office equipment, then tried to leave by the fire escape, but could not use it because of the smoke and heat. The group moved to another area but were driven back by the smoke. Two women decided to try the fire escape again, but could not get to it because the roof of the office began to fall in. The women climbed out the window and jumped, landing on a first-floor veranda. From there they were rescued by firemen. The women who had stayed in the office died in the fire. Another woman jumped from a third floor window, hitting the veranda and then landing on the road. She died soon after from her injuries. The staff in the dress-making section on the second floor escaped after taking the stairs and leaving the building just as the upper parts of the store began to collapse. The eight women in the millinery department had delayed leaving, not realising the danger. Only the supervisor and one of the department staff made it safely to the fire escape and down. The other seven died after they collapsed from smoke inhalation. Outside the firemen struggled to fight the flames in vain. They were able to rescue Kenneth Ballantyne when he broke a window and climbed out onto the parapet of the building. Hoses were used to wet him down until ladders could be moved into position. Just as he reached ground, power lines burned out and sheets of blue flame swept along the face of the store. His was the last rescue. By now over 200 firefighters using 20 appliances were fighting the blaze, but they were unable to make any headway against the fire. By 6:00pm firemen, policemen and volunteers were able to begin the search for bodies lying in the charred ruins. The fires finally burnt out completely by 8:00pm. The last bodies were not carried out of the building until 21 November. 41 people had died in the blaze. The store itself was made up of seven smaller buildings linked together, and was four storeys high in some places. Some parts of the building had no access to fire escapes. Around the outside of the building was a veranda which made it difficult for the fire fighters to put up their ladders. At first the firefighters had only shorter ladders which could not reach the windows on the upper floors. This delayed the attempt to rescue the trapped workers. The rambling nature of the building meant that once started a fire could travel quickly through the store. There were no fire sprinklers, and the materials used to line parts of the building were wooden match lining and pinex, both very flammable. A civic funeral service was held in the Anglican Cathedral on 23 November, followed by a mass burial. 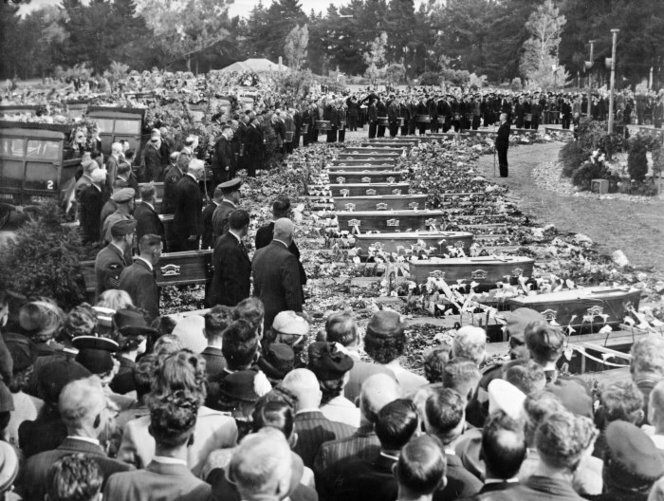 It was the largest funeral in Christchurch’s history. A commission of inquiry into the disaster opened in Christchurch two months later. 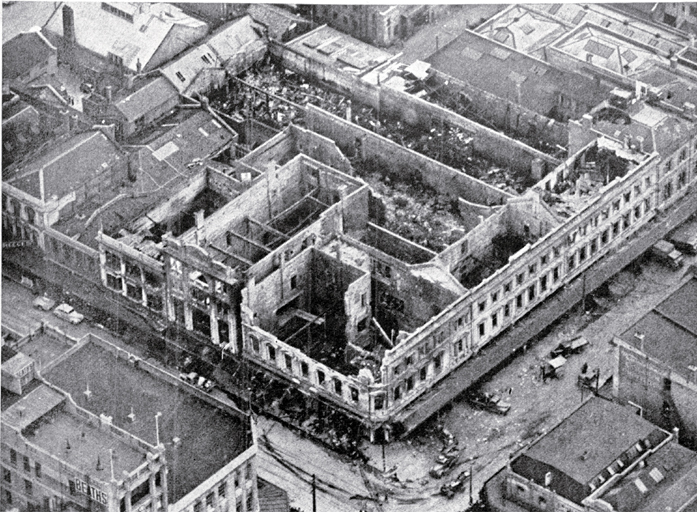 Aerial view of the gutted shell of the three-storied department building. CCL PhotoCD 1, IMG0016. No definite cause of the fire could be found, but the report of the commission pointed to two factors that had made the situation much more serious. The commission found that there had not been enough well-trained officers at the scene of the fire, and that the attempts to rescue the trapped workers had suffered from a lack of co-ordination and leadership. The fire brigade officers had not recognised the potential danger of the fire soon enough to act effectively. The building was unsafe, and did not meet city building regulations, although it had been inspected and passed four years earlier. The store management seemed to have not taken the risk of the fire seriously enough. There was no emergency plan in place and the staff had not been instructed on what to do in the event of a fire. There were no emergency alarms to alert staff, and no way of automatically contacting the fire brigade. The commission recommended changes in fire prevention and firefighting throughout New Zealand. It also recommended urgent changes to the building regulations and fire safety requirements to prevent another similar disaster. Ballantyne’s fire, Kevin Boon, Petone, 1990. Fires and firefighting, Gavin McLean, Wellington, 1992. The Ballantyne fire disaster, Gordon G. Walker, Christchurch, 1983. 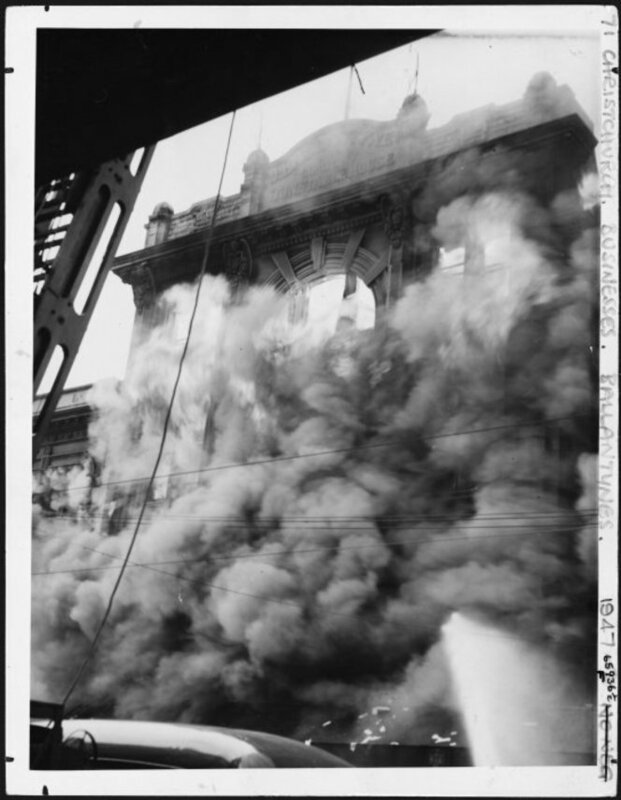 Ballantynes fire digital resource - digitised documents about the disaster.